Automatic Chart View options are now available for all views -- pre-defined views, as well as Custom Views -- in our free CRM and app-creator for Google App Engine. iFreeTools will automatically detect attributes which can be used to group data together and enable auto-charting options for those attributes, as shown below.. 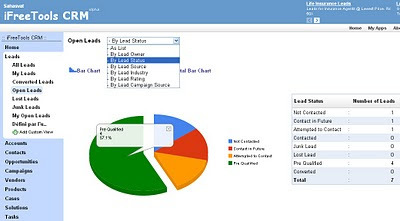 This feature is added to our core engine layer and hence available to both iFreeTools CRM and iFreeTools Creator applications. 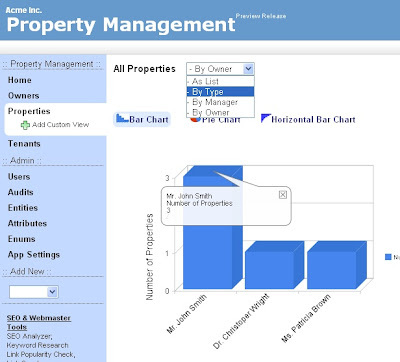 The following screen shot shows charting options in the Property Management application, we had built in our walk-through for iFreeTools Creator..
Current aggregation operation used is count - count of records, grouped by another attribute. We will soon be supporting other options like sum, which will be more useful when we introduce currency data-types. Go ahead and check out our auto-charting feature available in..
Customizable Application Builder for Google App Engine. and let us know your feedback.